Veja o Castelo de Stirling, o monumento Kelpies e o Loch Lomond nesta viagem de um dia de Edimburgo. Passe pelo Palácio Linlithgow no caminho para os Kelpies, considerados as maiores esculturas equinas do mundo. 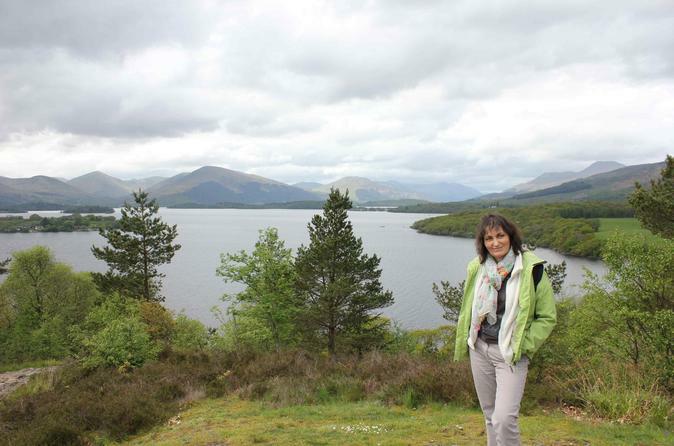 Em seguida, viaje através do Loch Lomond e do Trossachs National Park, onde você pode se juntar ao seu guia em um passeio pela natureza, antes de ir ao Castelo de Stirling para um tour opcional pelo interior (por conta do visitante). Esta excursão de pequeno grupo pela minivan da Mercedes é limitada a 16 passageiros para uma experiência memorável. Encontre seu guia no Rabbie's Cafe (6 Waterloo Place) no centro de Edimburgo e siga de ônibus até os Kelpies, passando pelo Palácio Linlithgow, o local de nascimento de Mary Queen of Scots, no caminho. Pare no monumento The Kelpies para ver de perto os cavalos de 30 metros de altura. As esculturas são um testemunho do poder dos cavalos que impulsionaram o desenvolvimento industrial da região central da Escócia. Depois, pegue o caminho de volta para Loch Lomond, viajando pelas terras protegidas do primeiro parque nacional da Escócia: o Loch Lomond e o Parque Nacional Trossachs. Siga uma rota cênica ao longo da costa leste do lago de 22 quilômetros de extensão (35 km), que é dominada pelo muito escalado Ben Lomond. Em seguida, viaje para onde as Terras Baixas se encontram com as Terras Altas, os Trossachs ou "The Highlands in Miniature". Contemple uma paisagem deslumbrante de montanhas íngremes, lagos cintilantes e florestas densas em um passeio pela natureza com seu guia. Faça uma pausa para o almoço (por conta do visitante) na aldeia de Aberfoyle, localizada dentro do Parque Nacional, antes de continuar para a cidade de Stirling, onde você pode visitar um dos mais magníficos castelos da Escócia. Opte por fazer um tour interior independentemente (por conta do visitante) para aprender sobre a história do castelo. Sua viagem de um dia em pequenos grupos termina com o retorno para Edimburgo. Adorei o passeio. O tempo é suficiente em todos os locais. Os kelpies são impressionantes pelo tamanho e estrutura, é feita uma visita rápida. Em Loch Lomond existe o lago, o qual não me interessou muito, o inicio de uma trilha, onde se observam áreas de mata, interessante. 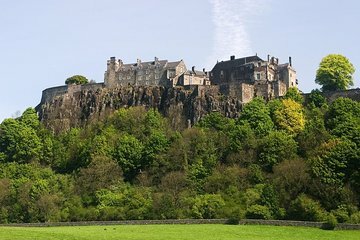 O Castelo de Stirling é legal, não tanto quanto o de Edimburgo, mas tem uma historia muito interessante. O guia foi ótimo: educado,, tinha conhecimento sobre os locais e foi bastante prestativo. This tour was very interesting, first we were taken to the big double statue of the two horses, then to Loch Lomond, enough time for lunch, then we proceeded to the castle which is my real point of interest since I'm following Mary, Queen of Scotts. Our driver and tour guide Gavin is really very nice and informative. Our tour director Graham was knowledgeable and funny.  The tour encompassed the spots that were advertised and we were satisfied with what we saw. We also felt very safe with Graham’s driving. He also had some suggestions about buying a clan map and when to look out of the window for a particularly good view. He was also quite friendly in taking a picture of my husband and me at the Kelpies. Graham was excellent when he spoke, but we had a member of the tour who took over some of the commentary by rambling on about the American Civil War. I am not sure how a tour leader shuts down such a person, but the tour would have been more enjoyable if he had.All around a good experience and I would recommend it to others. The tour was interesting and the tour guide was wonderful. There was a walking tour around the Loch that was quite slippery and probably wasn't necessary-- next time I wouldn't do that portion. The castle was great. We planned a manageable day trip to Loch Lomond and Stirling castle, this being one of the shorter trips. The first stop at the Kelpies was brilliant. Mahri was a lively guide and gave us a good introduction to the importance of Stirling Castle as the key stronghold of the Scottish Kingdom. Impressive castle and enough time to look around. Well planned day with enough stops to break up the bus trip into comfortable portions. The Giant Horses don't belong on this tour. People who want history, don't care about these statues. The day was not great, so we spent almost no time at Loch Lomond which was a great disappointment. We had tickets for Sterling Castle so got to do the tour inside. That was wonderful. Loved Mike's stories during the drive--he is very knowledgeable and entertaining. We enjoyed the drive into the country to see Stirling Castle. Interesting castle, well kept, lots of history. We had lunch (on our own) in the small town of Calendar. It had started to rain, so my friend had to buy a rain poncho! Next was a walk along Loch Lomond. Even in the drizzle, it was an awesome time, loved the walk! Very fun day! This was an amazing tour! Rabbies did a great job getting us there quickly, safely, and in good company. Our guide was Mahri, and she did a phenomenal job! She had a great balance of sharing stories of Scotland, playing music that was connected with her stories, and providing some quiet time on the bus. The particular tour was a shorter day about 9 hour day which was nice to give us some more relaxed time when we got back to Edinburgh. We had a great tour. Our guide Sharon was a bible of information. Very good driver also. Nice castle but I expected more. But dont miss the kelpies, you wont believe it when you see them. And the good thing about this tour is that its a small group. Thank you Sharon.